The Deep Anadarko Basin of Western Oklahoma is one of the most prolific gas provinces of North America. Wells drilled here have been among the world's deepest. 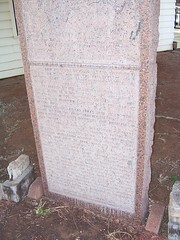 The Bertha Rogers No. 1 in Washita County, drilled in 1971 to 31,441 feet, was then the world's deepest well. In 1979 the No. 1 Sanders well near Sayre became Oklahoma's deepest gas producer at 24,996 feet. When controls on gas prices were lifted, Anadarko justified the faith and perseverance of The GHK Company and other operators who pioneered in deep drilling. 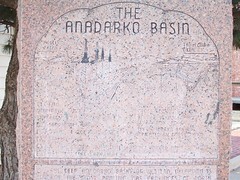 The shallow horizons of Greater Anadarko account for much of this nation's proved gas reserves. Deeper sediments below 15,000 feet remain virtually unexplorated. Renewed assessment of some 22,000 cubic miles of deep sediments may carry over into the 21st Century. 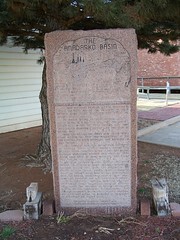 For 20th Century's final quarter the Basin remains the frontier of deep drilling technology centered on Elk City, "Deep Gas Capital of the World". As gas prices equate more closely to value, the nation's needs may be met increasingly from this massive sedimentary basin, a focal point in drilling innovation and geological interpretation. In re-energizing America, Anadarko will not yield its gas easily or briefly. Promised rewards lying beyond the threshold of drilling techniques demand massive investment. In challenging the inventive enterprise of America's energy industry, this Basin will remain the heartland of technology in penetrating the earth's crust. 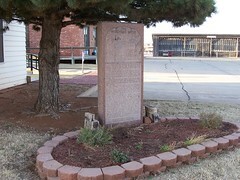 Located at the Old Town Museum complex at 3rd and Pioneer, in Elk City, Oklahoma. East side of small white chapel.